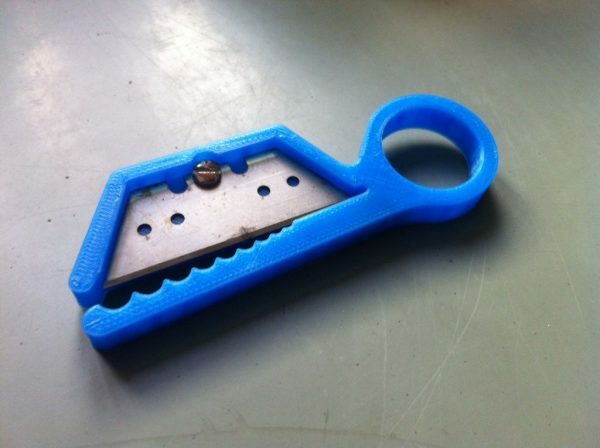 Wire stripper #3DThursday #3DPrinting « Adafruit Industries – Makers, hackers, artists, designers and engineers! I had to reshape a little bit the original to fit the blades I have over here, with a little narrower shape an 3 slots, so neither the shape nor the hole for the screw was fitting. I used Blender for reshaping. Scan the blade, put as a background image and working on orthogonal top view, edit the object selecting a moving the vertices to fit the blade, easy and fast. The design is very nice and it works like a charm.